Marcus Jackson played collegiality for the TCU Horned Frogs, where he battled with Andy Dalton for the starting job. 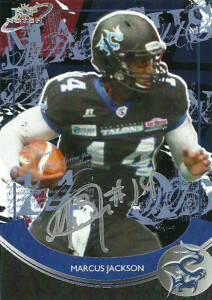 He signed with the San Antonio Talons as an emergency afterthought when starting quarterback Rohan Davey sustained a season ending injury. At first it appeared he’d back up Jeff Kent at quarterback, but Jackson came in during the final game of the 2013 season and sparked the team to victory over the Philadelphia Soul. A dangerous scrambler, Jackson is deft with his legs. In 2014 he came on in occasional relief of Shane Boyd and Mitch Mustain, but unable to supplant them at quarterback or spark the team to victory he was released during the season when the team signed Matt Bassuener. Jackson has also seen stops with the Wichita Wild, Texas Revolution, and the Wichita Falls Nighthawks of the IFL.